Epicranium is more or less dorsoventrally flattened and partly retracted into prothoracic sclerite, normally without traces of disarticulation into constituent sclerites except for clypeus often separated in front of frons and sometimes also with reemains of secondary V-shaped suture, which does not correspond to the epicranial suture or ecdysial line in larvae (Stickney, 1923; Bitsch, 1973), only in Stylopidae head is always outside. In the majority of cases head is directed forward (prognathous) although sometimes it may be oriented downwards (hypognathous) or obliquely backwards (hypognathous). Capsule is connected with prothoracic segment only by membrane or in polyphages with a head having higher mobility anterior and posterior cervical sclerites. A characteristic feature of beetles is a considerable elongation of the lower surface of the head capsule with mouthparts on which there is a pair of gular sutures with one tentorial pit on each of them. These sutures initially reach occipital foramen posteriorly and gula anteriorly. Externally part of capsule adjoining mentum and not infrequently separated by suture is termed submentum. Inside these suture conform to keels providing construction of tentorium. Tentorium is formed by sclerotized invaginations of the external surface, forming rigid carcass of the capsule including transversal corporotentorium and paired antero-dorsally directed roots frequently extending anteriorly into laminotentoriium from which dorsal arms extend bearing against anterior tentorial pits in the places of antennal attachment. Compound (facet) eyes are normally well-developed and not infrequently are sufficiently large or sometimes reduced (particularly in some cave, underground and parasitic forms, in which they may disappear completely). Eyes in nearly all cases are arranged on the sides, so that a part of facets are turned upwards and others downwards. Sometimes they are shifted mostly to the dorsal side; in whirligig beetles and also in Amphiops (Hydrophilidae), Clambinae, Tetraopes (Lamiinae) et al., they are to a greater or lesser extent are divided by lateral edge so that each eye consists of one half facing up and another facing down. Simple eyes for the most part are absent and if developed there are only one or two at occiput (in Jurodidae of the suborder Archostemata, and also in Hydraenidae, Liodidae, Omaliinae=Staphylinidae, Dermestidae, Phloeo stichidae of the suborder Polyphaga). Antennal pits are a characteristic feature distinguishing beetles from many insects with a complete metamorphosis. Initially they are situated between the base of mandibles and anterior edge of eye (but not frontally as in the majority of Holometabola). This position indicates subcotical habitation of ancient beetles (Hlavac, 1972: "substrate grade"). However in some openly living forma they are they are to a certain extent shifted to the dorsal side. In some beetles between areas of attachment of mandibles and antennae there is a transversal groove, which is sometimes termed without reason "fronto-clypean suture", this groove from the inside conforms to the cusp, to which muscles adducting mandibles are attached and therefore it is better developed in forms with powerful mandibles and particularly developed molas. Apart from that a weakly membranized or even membranous groove separating "anteclypeus" or "preclypeus" is situated along the anterior edge. In many polyphages and some ground beetles antennal grooves are developed on the underside of the epicranium. First antennal segments are enclosed in those antennal grooves. Moreover there are often cavities on the surface of the epicranium, some of which are sometimes treated as mycangia. They can be paired in antennal pits (Brachyleptus: Kateretidae; Ctesibius: Artematopodidae) or an uppaired pit on frons (in lymexylids). However in other cases they are situated on the under side: unpaired medial cavities behind mentum in Floricateres pusillus (Lophocateridae) Sarothrias (Jacobsoniidae) Ptinidae, some Pharaxonothini and Pythidae; and also paired depressions on the sides of gular sutures of Helotidae, some Epuraeinae and Nitidulinae, Biphylidae, some Pharaxonothini, etc. For Dendroctocton us of bark beetles the functioning of such structures as mycangia for spores and conidia are regarded to have been established. On the underside of the epicranium of fungivorous Biphyllus lunatus (Biphylidae) there are very deep canaliculi going from each of the antennal grooves towards each other, however fungal particles are not discovered in those. Part of the head retracted into the prothoracic segment is usually separated by a transversal occipital line ("sutures") and sometimes in forms with hypognathous head (e.g. among Bostrichoidea) also has medial coronal line ("suture") apparently related to the elongation of this part of the capsule. Occipital foramen is usually wide, though in forms with cervical constriction (Aderidae, Anthicidae, Meloidae, Rhipiphoridae, etc.) it becomes so small that can be compared only to that of Diptera and Hymenoptera. 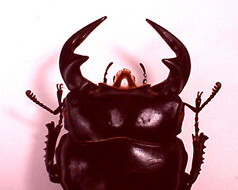 Elongation of the head in front of eyes, i.e formation of rostrum is a usual modification among beetles of different groups, however, it is most characteristic of the infraorder Curculioniformia. At the same time development of rostrum is traced also in Pselaphinae, Omaliinae (Tanyrhinus) and Scaphidiinae (Staphylinidae) of Staphiliniformia; Ptilodactylidae of Elateriformia; in genera close to Nepharis (Silvanidae), some Mystropini (Nitidulidae), Rhinomalus (Laemophlaeidae), and also in Mycterus (Mycterinae), Rhinosimus, Vincenzellus (Salpingidae), Diaphanops (Sagrinae), Lycidae, Mitraelabrini (Anthicidae), Allecullinae (Tenebrionidea) of Cucujiformia. Some beetles with rostrum are more or less connected with flowers (Mystropini, Mycterus, Diaphanops, Lycidae) and rostrum favours attainment of pollen and nectar in the corolla of a flower and sometimes the appearance of curculionid forms as a group specialized in feeding on cones of Early Mesozoic gymnosperms (Kirejtshuk, 1989). 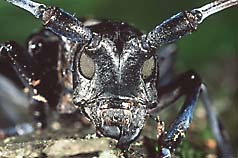 However staphiliniformic insects having rostrum and also Rhinomalus or Salpingidae never visit flower and on the contrary never had anthophylous ancestors. The majority of curculioniformic forms never had anthophylous ancestors. The majority of curculionid forms use the rostrum for penetration inside plant tissues and making holes for laying eggs (they often display dimorphism manifested in a longer tube in males, particularly long in females Aglycedrinae, Antliarhininae and some Brentinae). Bitsch J. 1973. 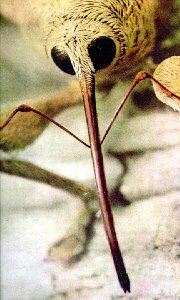 Systeme squelleto-musculaire de la tete des Insectes. In: Grasse P.P. (ed.). Traite de Zoologie. Masson et Cie, Paris. Tome VIII. Fasc. 1 (quated after Crowson, 1981). Stickney F.S. 1923. The Head Capsule of Coleoptera. Illinois Biological Monographies. 8, 1 (quated after Crowson, 1981).